Minster’s Emily Stubbs collides with Russia’s Riley Hammonds at home plate after the ball got past Hammonds during a nonconference season opener on Saturday in Minster. 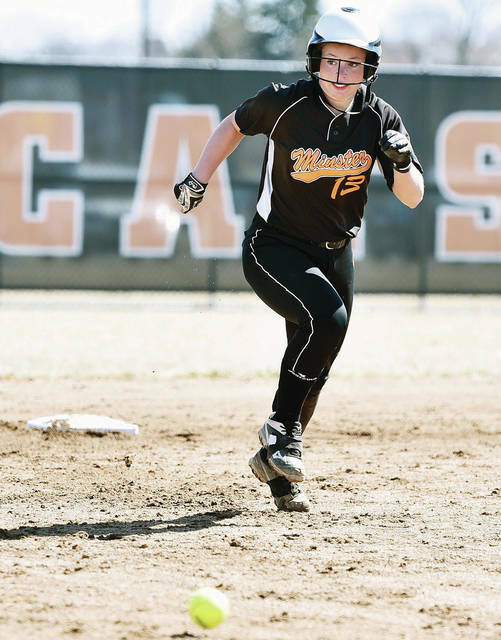 Minster's Kaitlyn Wolf watches a ground ball go by as she runs for third against Russia during a nonconference season opener against Russia on Saturday in Minster. 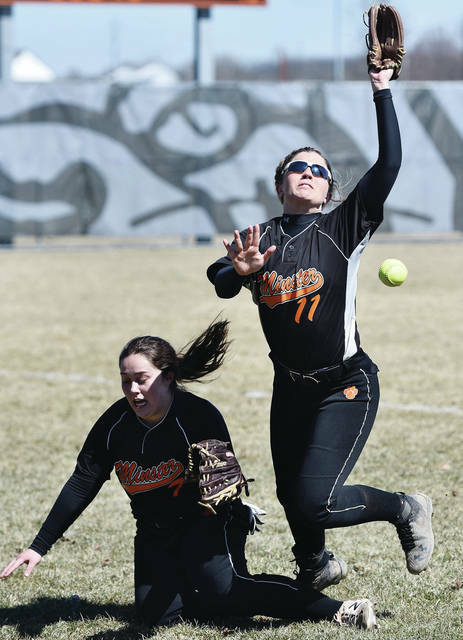 Minster's Mara Schmiesing runs towards third as Russia's Jenna Cordonnier fields a ground ball during a nonconference season opener on Saturday in Minster. Minster's Samantha Trego and Taylor Homan chase a pop fly during a nonconference season opener against Russia on Saturday in Minster. 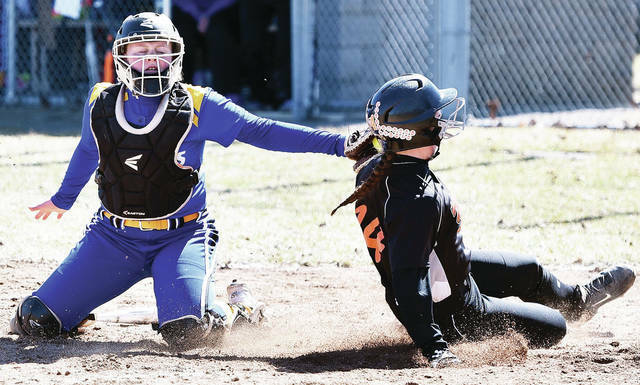 Russia’s Jenna Cordonnier waits for the throw to second as Minster’s Samantha Trego slides onto the base during a nonconference season opener on Saturday in Minster. 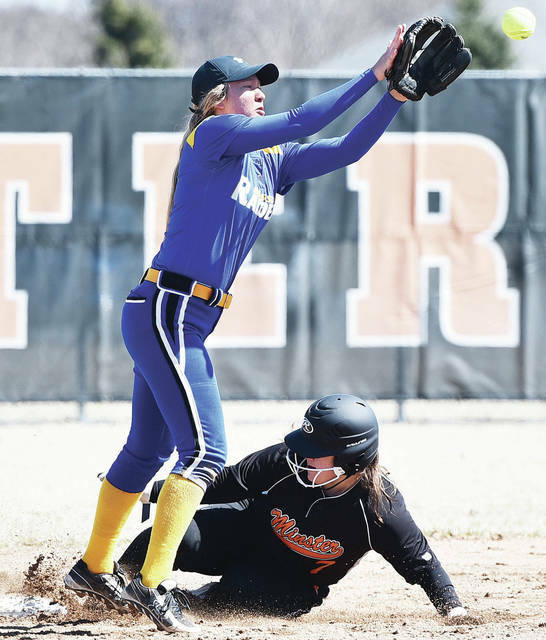 Minster's Samantha Trego waits for the throw as Russia's Makenna Borchers runs to third during a nonconference season opener on Saturday in Minster. Russia's Riley Hammonds attempts to tag out Minster's Karly Richard at home plate during a nonconference season opener on Saturday in Minster. MINSTER — Minster scored three runs in each the first and second innings to jump-start a 10-2 season-opening win over Russia on Saturday. Minster did all its scoring in the first four innings while Morgan Wenrick was in the circle for Russia. She allowed eight hits and six earned runs in four innings with three strikeouts and three walks. Sophie Francis allowed two hits and one walk in two innings for the Raiders. Taylor Homan hit a three-run home run in the first inning. Kaitlyn Wolf drove in a run on a double in the second and later scored on an error. Royce Glass finished the scoring in the second when she reached home plate on a passed ball. 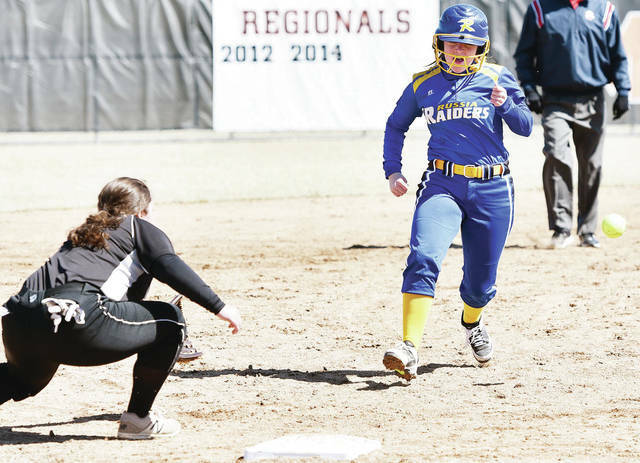 The Raiders added a run in the third when Jenna Cordonnier scored on a groundout, but Minster scored four runs on two hits, two walks and an error in the fourth to put the game away. Jenna Poeppelman allowed four hits and no earned runs in a complete game for Minster and struck out nine with one walk. Homan was 2 for 3 with 4 RBIs, Wolf was 3 for 4 with 2 RBIs and Karly Richard was 2 for 4. Wolf and Glass each scored three runs while Richard scored two runs. Cordonnier, Albers, Riley Hammonds and Ava Daniel each had a hit for the Raiders. Parkway advanced to a regional final last season and started this season strong by earning a run-rule win over the Wildcats in five innings in a season opener on Saturday in Houston. Houston committed six errors, which led to nine unearned runs for the Panthers. The Wildcats managed one hit against Parkway pitcher Macy Henkle, who had nine strikeouts in five innings. Fairlawn started the season with two losses to Southeastern in a doubleheader on Saturday in South Charleston. The Trojans won 4-1 and 15-2. “Got all their jitters out in the first game and just couldn’t string together hits for the second,” Fairlawn coach Dominic Lehman said. Junior pitcher Spencer Alig threw a no-hitter to help the Cardinals start the season with a victory in six innings on Saturday in New Bremen. Alig had eight strikeouts and needed 63 pitches to get through six innings. The Cardinals had seven hits and didn’t commit an error while the Jets committed four errors. Justin Tenkman was 2 for 4 and Jarod Keller was 2 for 2 and drew two walks. Ryan Bertke scored three runs and had one RBI. Tenkman, Aaron Vonderhaar, Spencer Elking and Keller each drove in one run apiece. The Wildcats scored nine runs in the first inning to spark a big season-opening win in five innings on Saturday in Ansonia. Minster had 20 hits and two errors while Ansonia had one hit and two errors. Jack Olberding was 3 for 4, Jack Heitbrink was 2 for 6, Trent Roetgerman was 3 for 4 and Dylan Sharp, Adam Ketner and August Boehnlein were each 2 for 3. Olberding, Heitbrink, Boehnlein, Roetgerman and Sharp each had one double. Heitbrink picked up the win on the mound. He allowed one hit and had four strikeouts in three innings. Noah Enneking had three strikeouts in one inning of work and Olberding had two strikeouts in one inning. The Jets dominated a season opener on Saturday in Sidney. Doug Wright pitched a complete game and had 13 strikeouts and two walks. Skyler Piper and Ethan Westerbeck were 2 for 3. Ashton Piper was 3 for 4 and Keith Orndorff and Drew Maddy each had one hit. Skyler Piper scored two runs while Ashton Piper, Westerbeck and Maddy each scored one run. Other scores: Houston 14, Springfield Catholic Central 0 (game played at Gastineau Field in New Carlisle). Cancelled: New Knoxville at Anna. Minster’s Kaitlyn Wolf watches a ground ball go by as she runs for third against Russia during a nonconference season opener against Russia on Saturday in Minster. 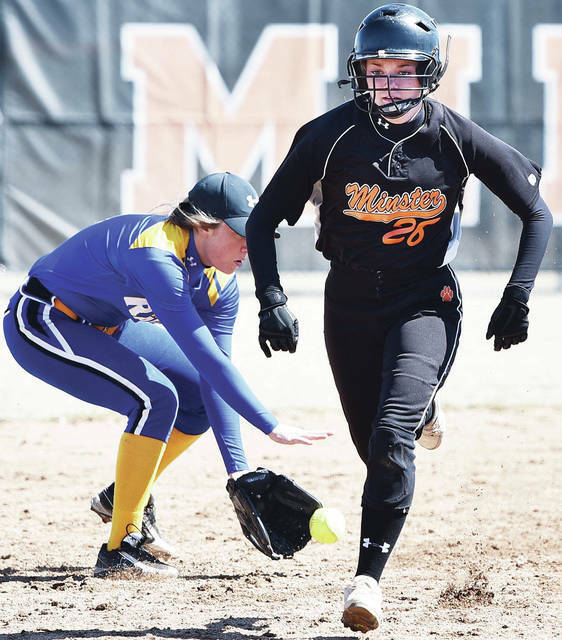 Minster’s Mara Schmiesing runs towards third as Russia’s Jenna Cordonnier fields a ground ball during a nonconference season opener on Saturday in Minster. Minster’s Samantha Trego and Taylor Homan chase a pop fly during a nonconference season opener against Russia on Saturday in Minster. Minster’s Samantha Trego waits for the throw as Russia’s Makenna Borchers runs to third during a nonconference season opener on Saturday in Minster. 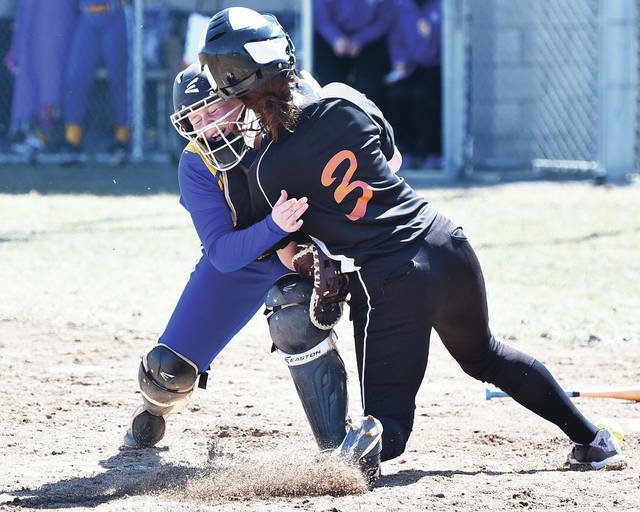 Russia’s Riley Hammonds attempts to tag out Minster’s Karly Richard at home plate during a nonconference season opener on Saturday in Minster.